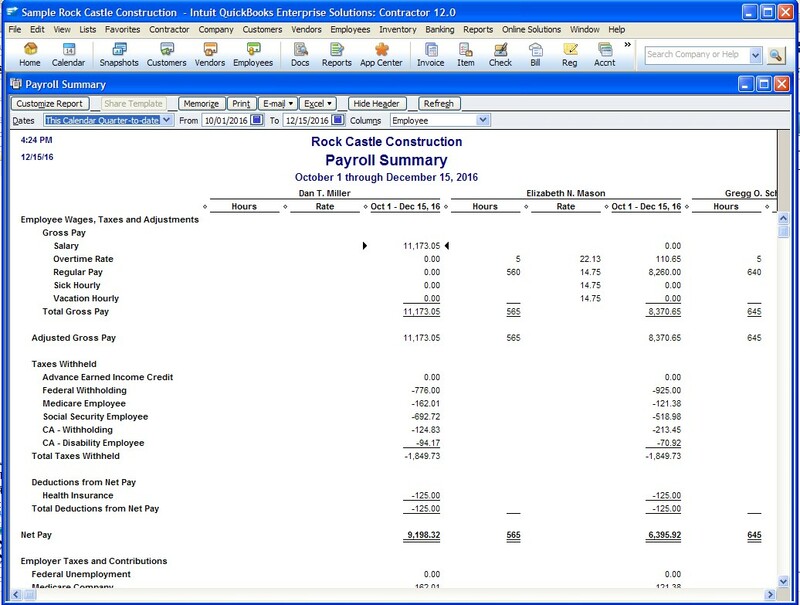 Paycheck transactions information is not stored in the separate table, but you can refer to Payroll Summary report in QuickBooks to view the payroll records of each employee. You can also add order keyword to your query to list the report by Employee Name. The sample output in VB Demo. Do you have any other documentation/ link available for this? Apparently we cannot run this report until we don't have Intuit Payroll subscription. Thank you for informing us about broken links. It seems page is not available. The fixing of a page might take some time. 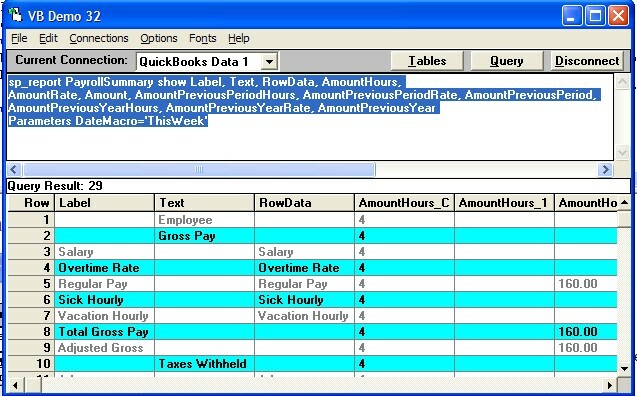 Please refer How to get information about Tables and Columns. Please use SP_columns tablename command in VB Demo to know list of fields and their details. Hello, thanks a lot for this helpful information! I am looking for historic employee rates, and it seems that Paycheck Transactions are the ones that are saving rates, hours and amounts at each payroll date. 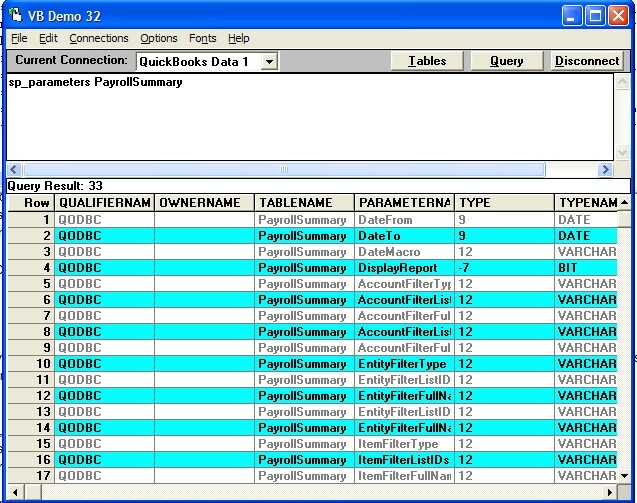 Do I understand correctly, that this Payroll Summary report is the only way to get access to this data, there is no actual table available? May it be added in the future? It would be really helpful for job cost analysis if these historic rates could be joined with timetracking table. I would like to inform you that the QuickBooks SDK does provides output of the report but does not provide information on how those data are derived or which tables are used in those reports. >> It would be really helpful for job cost analysis if these historic rates could be joined with timetracking table. I'm sorry to inform you that the historic rates is not available through the Intuit SDK so they are not available through QODBC. Thank you very much, this is helpful. Before I completely give up on historical rates, could you please comment on following: I found a 'Rate' column in TimeTracking table, but it is always empty in my queries. QuickBooks SDK onscreen reference does not list such object for TimeTrackingQuery. Could you please comment on where this column is coming from, and what we may need to do (maybe in QuickBooks) to get data in it? Thank you! I'm sorry to inform you that the Rate is not available through the Intuit SDK so they are not available through QODBC.